Track record: EUR/USD – 2016-11-28. 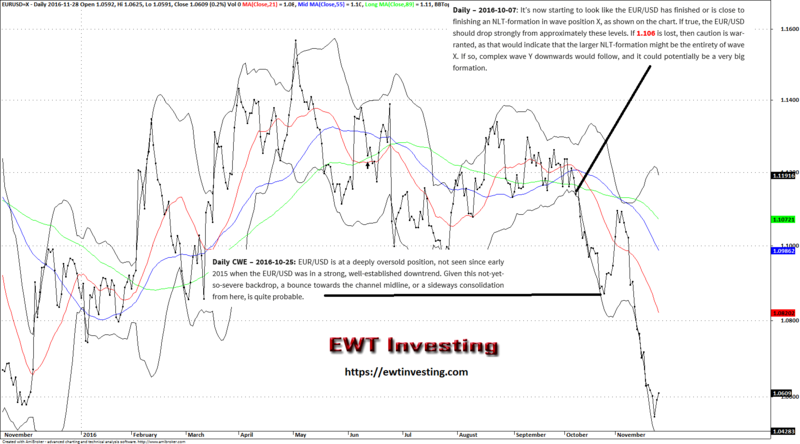 Today, let’s have a look at some of our latest calls for the EUR/USD. Our long-term model (from 2012…) for the EUR/USD continues to be in line with the markets idea of price movements, and continues to yield quite accurate shorter-term analysis. At the beginning of October 2016, we warned our subscribers that probabilities were strongly pointing towards a new large wave down in EUR/USD. In the attached chart, you can find our comment from the 7th of October 2016. And as we held most probable, the EUR/USD violently dropped from there. Some two trading weeks later, on the 25th of October 2016, we called a bottom, after our adaptive channel signalled an extremely oversold condition occuring in the EUR/USD cross. A very sizeable bounce took place, and reversed the oversold condition, before the market started to drop again, in line with the larger wave Y-formation (a corrective price pattern, which if chained with other corrections, is sometimes labeled as wave Y according to Elliott Wave Principle/Theory terminology), predicted at the start of October 2016. Become a subscriber to our Global Elliott Wave Coverage to find out what our current Elliott Wave Theory analysis of the EUR/USD suggests will happen next.